UPDATE: Sadly, Warner Brothers decided to take down all of the fun The LEGO Movie games and they are no longer available to play. If they make new versions available again with the release of The LEGO Movie 2 coming in February of 2019, I will be sure to add them here. The LEGO Movie is so popular. There are a lot of fun things you can do based on the movie and ways to learn from it as well. See our other The LEGO Movie posts for more ideas. Is your boy still enjoying the movie and all that surrounds it? I know a lot of boys who are still very much into it. Here are some fun The LEGO Movie games to play. I enjoyed a few of them myself! Make sure to stop by the LEGO SigFig creator first. Your boy can create his own minifig to use in the games–Awesome, right? There are a wide variety of games including some that are silly, some that are fun, and some that are challenging, they are sure learn something from playing. 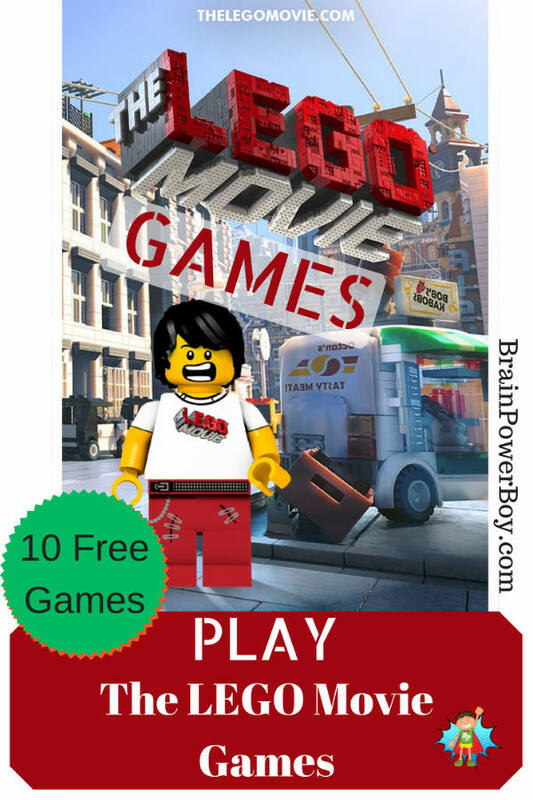 If your boy enjoys playing video games he just might enjoy checking out a few of these games based on The LEGO Movie. LEGO SigFig Creator. Create your own minifig and save the code so you can unlock him to play in some of the LEGO games. Cool! The guy I made in my image is from this LEGO Sig Creator. In the LEGO Game Builder you can either play games created by others or (Better Yet!) you can build your own game and share it for others to play. A whole lot of learning will occur with this activity. We really enjoy game builders in my family. Batman’s First Try is an arcade style game where LEGO Batman throws his batarang at lights and criminals. Help Emmet unglue bricks to defeat Lord Business in Brick Bust. It is a bit like Candy Crush or Bejeweled but with bricks. You unlock special images by completing levels. In The LEGO Movie Glue Escape Racing Game you race against Bad Cop to save your friend. Collect powerups along the way. I had a lot of trouble driving but my son did just fine- hmm. LOL. Sinkhole has Emmet plummeting through a sinkhole blocked by bricks. Your job is to avoid obstacles and go as far as you can. Use the mouse—arrows didn’t work for us. (FYI: The music is a bit ominous and Emmet yells and does not look too good when he hits a barrier.) Good hand-eye coordination game. The LEGO Movie Submarine Game is a bit unusual, especially since you are trying to keep Emmet, Wyldstyle, and Batman from drowning in the sub. You have to put certain shaped bricks in the submarine hull to stop the water from flowing. It gets challenging quite quickly. I am including it because placing the bricks is fun and a good learning exercise but I didn’t care for the idea of it much at all. Scramble is your typical scrambled picture game. 3 levels and 3 different backgrounds to try. In Get Dressed you have to try to get the right heads and clothes on the Minifigs as fast as you can. If your boy likes these games you can order The LEGO Movie Video Game here. And please stop by our new big page of LEGO Goodness! I also wanted to tell you about this neat LEGO movie activity guide you can get–just follow this link to our post on The LEGO Movie Books and you will find it there. Know other LEGO loving families? Send them over to the blog or share this with them on social media using the buttons below. Follow Brain Power Boy’s board Learning LEGO Style on Pinterest. My kids are going to LOVE these games!! Love these ideas! BTW, is there anyone who doesn’t love to play with Lego?! 😉 Thank you for sharing on We Love Weekends! Looking forward to see what you’ll share next! Well, I don’t personally know of anyone!